...You are looking for a material that, when appropriately understood and utilized, can be the durable foundation of your product, design, and business. My name is Tim Jahnigen, and as the inventor of the One World Futbol and Co-founder of the One World Play Project, I have the privilege of sharing my story with you all over the next few months. The PopFoam team and material are centerpieces to this story. They helped me fulfill not just my dreams as an entrepreneur, innovator, and inventor — but also improve the quality of life for tens of millions of children all over the world. I first learned about the amazing properties of this unique polymer years ago, but it wasn't until a couple of years later that I had my true “aha” moment. 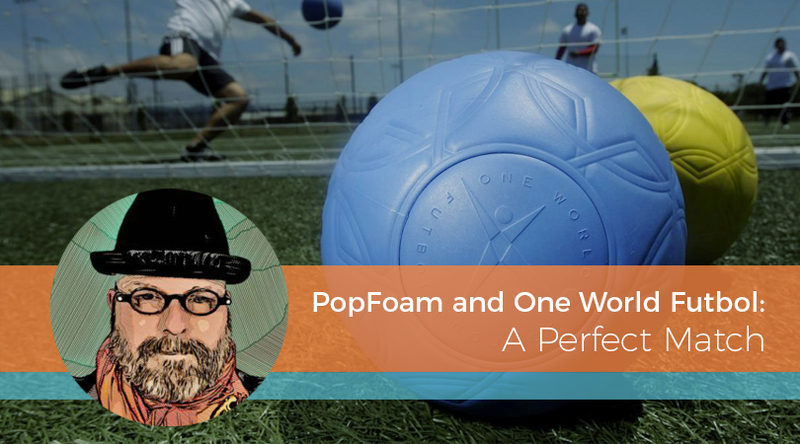 PopFoam's cross-linked, closed-cell foam and its team of bright engineers, designers, and manufacturers are responsible for so many industry-changing innovations. This material is lighter, stronger, and more flexible than rubber; it can be formulated to be hard as a rock or soft as a cloud, and it can be made super abrasion-resistant and shock absorbent — all without comprising quality, durability, and the customer experience. Where other brands see design limitations, PopFoam sees opportunities to find unique solutions. This material isn’t for every design application — and PopFoam knows that. Thanks to team members' wealth of industry knowledge, you can be confident they'll coach you through important design decisions, ensuring you make the right ones for your project. They understand that while they have unique insights to offer, at the end of the day, this is about your design journey, your product, and your company. Whether you're an engineer, a visionary entrepreneur, a designer, a student, or just plain curious, stay tuned as I share my insights and advice on how best to use this versatile, under-appreciated material. This is meant to be a dialogue, so I hope we get a chance to answer your questions or concerns — both in the coming blog posts and in your important queries. In the meantime, download your free copy of "The Ultimate Design Guide for EVA Injection Foam Molding." Recently made completed work on the first episode of a.. Imagine that eureka moment when a design idea becomes..